Angle closure glaucoma is a major cause of blindness worldwide, with a particularly high prevalence in some Inuit and Asian populations. This disease has a familial tendency and is associated with increasing age and hyperopia. In angle closure glaucoma, increased intraocular pressure is caused by impaired outflow facility secondary to appositional or synechial closure of the anterior chamber drainage angle . In primary angle closure glaucoma, the underlying mechanism is primarily pupillary block, while in secondary forms there are other underlying causes that either push the iris forward from behind or pull the iris forward to contact trabecular meshwork. Both types of angle closure glaucomas may cause acute dramatic attacks or chronic asymptomatic disease. A thorough history and eye examination are essential in differentiating between primary and secondary forms. This distinction is crucial as the treatment of each form can vary greatly. The mainstays of therapy are medications that lower intraocular pressure and laser peripheral iridotomy for any component of pupillary block. Although angle closure in all its forms is vision threatening, early diagnosis and appropriate management can stabilize disease and minimize vision loss. This review will discuss risk factors, signs and symptoms, diagnostic tests and imaging modalities, pathophysiology, differential diagnosis, and treatment modalities of angle closure glaucoma. Angle closure glaucoma (ACG) results from appositional or synechial closure of the anterior chamber angle leading to reduction in aqueous outflow facility, IOP elevation, and subsequent damage to the optic nerve with associated visual field loss. There are primary and secondary forms of angle closure glaucoma . In primary angle closure, the mechanism causing disease is primarily pupillary block, being either functional or absolute, while in secondary forms there are other underlying causes. Primary angle-closure suspect (PACS) or anatomic narrow angle – An eye in which the anterior chamber angle recess has an abnormally narrow angular width. The peripheral iris is located close to, but not touching, the posterior pigmented trabecular meshwork (TM). No PAS are present. IOP, optic nerve, and visual field are normal. Primary angle closure (PAC) – An eye that has a primary anatomic narrow angle and evidence that trabecular obstruction by the peripheral iris has occurred, such as peripheral anterior synechiae (PAS), elevated IOP, iris whorling or sectoral atrophy, and excessive pigment deposition on the trabecular surface. The eye does not have glaucomatous damage of the optic nerve. Primary angle closure glaucoma (PACG)-iridotrabecular contact is present in three or more quadrants of the drainage angle in the presence of documented optic nerve damage and visual field loss. Secondary angle closure is caused by an underlying identifiable pathologic etiology, such as neovascularization or uveitis (see “Differential Diagnosis” section). If angle closure results in elevated IOP that causes glaucomatous optic disc damage, it is referred to as secondary angle closure glaucoma. Both primary and secondary angle closure can result in acute angle closure attacks and chronic angle closure leading to glaucoma. Risk factors for secondary angle closure are related to the underlying diseases that cause it. See Differential Diagnosis section for a list of the various eye diseases that can cause angle closure. Eyes that experience angle closure are not only anatomically different than normals — they have shorter axial lengths, shallower anterior chambers, thicker and relatively anteriorly positioned lenses, and flatter corneas — but they are also physiologically different. Thicker irides may increase the posterior to anterior pressure differential. Dynamic factors in angle closure eyes that can contribute to increased pupillary block are the tendency to retain more iris volume after dilation and choroidal expansion causing forward lens movement. As imaging modalities, such as ultrasound biomicroscopy and anterior segment optical coherence tomography improve, these dynamic factors will be better studied and understood. A less common cause of primary angle closure is anterior non-pupillary block. 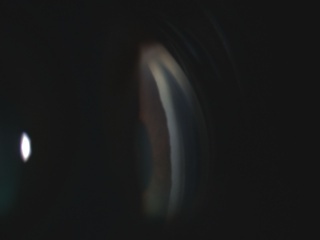 This is observed in eyes in which angle closure progresses despite a patent iridotomy, for example, as seen in plateau iris. Plateau iris configuration is characterized by a normal central anterior chamber depth, flat iris profile, and crowding of the angle by the iris base. There is a forward displacement of the iris base by anteriorly located ciliary processes that can lead to subsequent angle closure. Plateau iris syndrome occurs when an eye with plateau iris configuration develops a closed angle. Prominent last iris roll is another mechanism of anterior nonpupillary block in which a very thick iris with prominent peripheral circumferential folds becomes more pronounced and contacts trabecular meshwork with dilation. Secondary angle closure glaucoma is caused by a myriad of other eye diseases (see Differential Diagnosis section). There are several secondary causes of angle closure that involve relative and absolute pupillary block. In phacomorphic glaucoma, the mass effect of a thickened or intumescent cataract pushes the iris forward and causes pathological angle narrowing. Forward displacement of the lens in ectopia lentis or microspherophakia can also push the iris forward and shallow the angle. Absolute pupillary block occurs when there is no movement of aqueous through the pupil because of 360o posterior synechiae between the iris and a crystalline lens, an intraocular lens, capsular remnants, or the vitreous face. In secondary angle closure glaucoma without pupillary block, angle closure is due to either a.) contraction of an inflammatory, hemorrhagic, or vascular membrane in the angle leading to PAS, or b.) forward displacement of the lens-iris diaphragm, often associated with ciliary body swelling and anterior rotation. Given the high prevalence and morbidity of angle closure glaucoma in many countries, there is a need for quick, inexpensive screening methods that do not require highly skilled operators. Oblique flashlight test uses a penlight that is held next to the temporal side of an eye with the beam of light parallel to the iris and shining across the anterior chamber. If there is a shadow projected onto the nasal iris, the angle is narrow because the iris is bowed forward and blocking the path of light. If there is no shadow, the anterior chamber angle is considered open. Because of variability in flashlight illumination and subjectivity in assessment of the test result, however, this test has a relatively low specificity. The Van Herick method uses a narrow slit beam at 60o onto the cornea just anterior to the limbus to evaluate the anterior chamber depth. If the distance from the anterior iris surface to the posterior corneal surface is less than one-fourth the corneal thickness, the angle may be narrow and should undergo gonioscopy. Modification of this method by creating additional grades, called the limbal chamber depth test, outperformed central anterior chamber depth (as measured by optical pachymetry and ultrasound) and autorefraction as a screening tool for the detection of occludable drainage angles identified by gonioscopy. The goal of screening for narrow angles is to identify patients at risk of developing angle closure and to treat prophylactically with a laser peripheral iridotomy (LPI). Patients with narrow but open angles should be followed for IOP elevation, progressive angle narrowing, and development of PAS. There is no evidence that iridotomy is indicated for narrow but open angles with normal IOP; however, LPI is fairly safe and can prevent a potentially vision-threatening outcome so the risks and benefits must be carefully considered in each case and discussed with the patient in details. Diagnosis of both primary and secondary angle closure glaucoma is based on history and eye exam. Gonioscopy is the gold standard for evaluating the anterior chamber angle, but imaging modalities assist in quantifying and objectifying angle characteristics. To distinguish between primary and secondary causes, the clinician must actively look for signs and symptoms of possible secondary causes and rule each out before the patient can be diagnosed with primary angle closure glaucoma . Incisional or laser surgery – can cause anterior chamber inflammation or predispose to epithelial/fibrous ingrowth; may also lead to aqueous misdirection (e.g. after LPI) or ciliary body engorgement (e.g. after extensive panretinal photocoagulation). Evaluation of fundus and optic nerve – dilation is often not advisable in primary angle closure attack until an iridotomy has been performed and/or the acute attack has resolved as dilation can exacerbate the condition. In contrast, dilation may be permissible as the appropriate treatment in certain forms of secondary angle closure. The fundus should be examined for underlying causes leading to the angle closure. Signs of a primary anatomic narrow angle on slit lamp exam can be subtle and include a shallow anterior chamber and an anteriorly bowed iris. Both primary and secondary forms of angle closure can cause acute angle closure attacks. The intraocular pressure usually exceeds 40 mmHg and may rise to as high as 80 mmHg. The conjunctiva is significantly injected. The cornea develops stromal and microcystic edema in response to the acute rise in eye pressure and decompensation of the endothelial pump mechanism. Iris sphincter ischemia leads to a fixed, mid-dilated pupil. Sectoral iris atrophy may occur, releasing pigment into the anterior chamber that dusts the corneal endothelium and anterior lens capsule. The overall anterior chamber is shallow. The center is usually formed, but the mid-peripheral iris bows forward and may touch the peripheral cornea. Often there is anterior chamber inflammation. The fundus is typically difficult to examine because of corneal edema. If visualized, the optic nerve head may be hyperemic and edematous. The angle is often difficult to examine with gonioscopy because of corneal edema, but if visualized, reveals contact of the peripheral iris with cornea. In the aftermath of an acute attack, pupillary distortion may result if there is permanent sphincter damage and/or iris atrophy. Anterior lens capsule opacities, known as glaukomflecken, may result from damage to the anterior lens epithelium from high intraocular pressure. The angle may have permanent synechiae formation. Intraocular pressure may be low if the ciliary body is so ischemic that aqueous humor production is compromised. As the ciliary body recovers, normal aqueous humor production resumes and the intraocular pressure rises. ACG exhibits signs of optic neuropathy in the typical glaucomatous pattern with increased cupping of the optic nerve and retinal nerve fiber layer dropout. Ciliary body engorgement associated with retinal vascular occlusion or panretinal photocoagulation – anterior rotation of iris and lens; retinal signs of each underlying etiology, e.g. retinal hemorrhages for vein occlusion and extensive retinal laser scars from photocoagulation. Patients with anatomic narrow angles without acute angle closure are typically asymptomatic in both the primary and secondary forms. Similarly, primary and secondary chronic angle closure patients often experience no symptoms unless they develop end-stage glaucoma, in which case they may complain of decreased vision or reduced peripheral vision. Acute angle closure, on the other hand, usually presents with dramatic symptoms from the quick rise in intraocular pressure. Patients complain of blurred vision, rainbows, halos around lights, or even transient loss of vision. They often have intense pain that may be localized to the eye, may follow the trigeminal distribution, or may be described as diffuse discomfort. Nausea and vomiting are common. Subacute or intermittent angle closure attacks are brief episodes of angle closure that resolve spontaneously. Patients experience the above symptoms of acute angle closure, but on a milder scale. They will typically experience some blurring of the vision or halos with mild to moderate eye pain, brow ache, or headache. These attacks are often resolved by entering a well lit room which may cause miosis or sleep as sleep-induced miosis ameliorates the lesser degree of pupillary block in these patients. The key to diagnosis of anatomic narrow angle or angle closure is gonioscopy, which is still the gold standard method of angle evaluation. 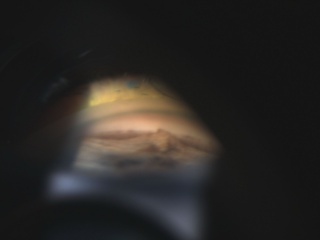 The ideal way to perform gonioscopy is in a dark room using a small rectangle of light only as bright as necessary to view the angle structures, as light can open an appositionally closed angle in about one-third of cases. Dynamic or compression or indentation gonioscopy is essential to differentiate appositional closure from synechial closure. Gentle pressure on the cornea with the goniolens pushes back the iris and reveals whether the angle can be opened any further; if not, synechial closure is present. This maneuver can also help break acute attacks by forcing fluid into the periphery and opening areas of appositional closure. Occludable angles are typically described as eyes in which the posterior, usually pigmented, trabecular meshwork is seen for less than 90° of the angle circumference or if the angle width is less than 20°. Change in angle configuration after indentation performed described by putting the original insertion in parenthesis, followed by the insertion after indentation. For example, if indentation shows that the insertion is actually a D when it originally appeared to be a C, it is indicated as a (C)D.
Various provocative tests have been developed in an attempt to separate out patients who may be at higher risk of angle closure. In these tests, different maneuvers are used in an attempt to induce pupillary block, and then the pressure is rechecked and the angle is examined for narrowing. A test is considered positive if the IOP increases by 8 or more mmHg. In the dark room test, patients are placed in a dark room for 1-2 hours to dilate the pupil and increase resistance at the lens-iris channel. The prone test involves placing the patient in the prone position for 1-2 hours without sleeping to anteriorly displace the lens and increase pupillary block. These tests have not been found to be very predictive of angle closure. Combining anterior chamber imaging (e.g. ultrasound biomicroscopy) with provocative testing assists in detecting apposition and allows measurement of various parameters of the angle,  but their ability to predict future angle closure is not well established. Pharmacologic provocative tests using mydriatic eye drops to increase pupillary block via pupil dilation have fallen out of favor as they carry a significant risk of angle closure in and of themselves. To supplement information obtained through gonioscopy, there are several anterior segment imaging devices available that provide detailed images of structures and quantitative measurements. They are useful in primary angle closure but can also help detect secondary cases of angle closure, such as ciliary body masses or anterior rotation. At this time, there are no widely agreed upon quantitative measurement cutoffs obtained from these devices that distinguish a narrow angle from an open one. This high-frequency B scan ultrasound provides high-resolution cross-sectional images of the anterior segment of the eye to the anterior vitreous. Because it uses sound, it can pass through opaque structures to visualize structures hidden from direct clinical examination, such as the ciliary body. It is particularly helpful for evaluating plateau iris and other ciliary body pathology. The disadvantages of UBM include: requirement of a water bath immersion, specialized equipment, and a skilled technician to operate; it is also relatively costly and time consuming. This modality uses a diode light source instead of sound to produce highly detailed images of the cornea, angle region, and anterior ciliary body similar to those seen with UBM. Compared to UBM, AS-OCT is unable to image structures posterior to the iris plane well because of posterior pigmented iris shadowing and scleral light scattering. The advantages of AS-OCT are that it is a noncontact exam: the patient can be imaged in an upright position avoiding positional lens changes, and all four quadrants can be scanned at once. Digital images of the anterior chamber angle can be obtained using a Scheimpflug camera. Rotating versions of the camera provide three-dimensional photos that can be analyzed by computer software to measure specific parameters of the angle. The camera has an easy-to-use slit lamp type configuration but is expensive and requires special equipment. It cannot image the ciliary processes or body behind the iris. Optic nerve assessment and imaging, retinal nerve fiber layer analysis, and visual field testing should be preformed to assess for signs of glaucomatous optic neuropathy in any patient with angle narrowing or angle closure glaucoma. The main entities to distinguish are primary angle closure versus secondary causes of angle closure because treatment may differ depending on the etiology. Primary disease tends to be bilateral, while disease caused by a secondary etiology may be unilateral or bilateral. Please refer to the previous tables for various causes of secondary angle closure glaucoma. The overall goals for management are to reverse or prevent the angle closure process, control intraocular pressure elevation, and prevent damage to the optic nerve. Some primary and secondary forms of angle closure may be treated similarly, while others require very different treatment approaches based on their underlying pathophysiology. IOP is lowered with glaucoma medications. Iridotomy is an essential part of treatment in PAC, but may not be indicated in some forms of secondary angle closure glaucoma. Trabeculectomy and tube shunts may also not be indicated for certain secondary forms of angle closure glaucoma. Miotics (e.g., pilocarpine 2%) may help break an early angle-closure attack, but may be ineffective if the iris is already ischemic. High-concentration miotics (e.g., pilocarpine 4%) should be avoided because of the potential for forward displacement iris-lens diaphragm. Carbonic anhydrase inhibitors – oral acetazolamide’s maximum IOP reduction is reached in 2-4 hours and lasts for 6-8 hours. Intravenous acetazolamide drops the IOP within 2 minutes with a peak effect noted by 10-15 minutes. In acute situations, a single dose of 500 mg acetazolamide should be given orally if the patient is not vomiting. Regular acetazolamide is preferred over the sustained-release sequel form because of quicker onset of action. If the patient is vomiting, acetazolamide can be given intravenously. Mannitol can decrease the IOP 30 mm Hg or more within 30 minutes of administration. The recommended intravenous dose is 0.5-1.5 g/kg body weight as a 15% or 20% solution, delivered at 3 to 5 mL/minute. Frail patients with cardiac or conditions may develop circulatory overload, pulmonary edema, congestive heart failure, and electrolyte imbalance. A rapid reduction in cerebral volume may result in subdural hematomas from vein rupture between the sagittal sinus and cortical surface. Therefore, patients receiving IV mannitol should be monitored in a hospital setting. Glycerin: 1 to 1.5 g/kg body weight of a 50% solution. Onset of pressure reduction is typically 10 to 30 minutes. Avoid in diabetics because the increased caloric load can cause ketoacidosis. Isosorbide is commercially available as a 45% (45 g/100 mL) solution (Ismotic; Alcon Surgical). The recommended dose is 1 to 1.5 g/kg body weight. Its effect is similar to glycerin’s but is safe for use in diabetics because it is not metabolized. Although less common, oral agents can also cause subdural hematomas. Headache and gastrointestinal upset are common adverse reactions. Paracentesis Can be perfomed in an acute setting. Technically, it can be difficult to perform on a phakic eye in pain with a shallow chamber, and there is a risk of permanent damage to the cornea, lens, and iris. Devastating complications such as endophthalmitis and choroidal hemorrhage from a rapid pressure drop may occur. Also the effects are typically short-term, because, as the ciliary body begins to form aqueous again, the IOP will inevitably rise. This procedure can be used in cases of extreme IOP elevation to “buy time” until medications take effect or iridotomy can be performed. Laser Iridotomy Should be performed as soon as possible in the affected eye and in the contralteral eye to avoid an attack of acute angle closure glaucoma in the future. Very few studies exist to address medical therapy in chronic angle closure glaucoma after laser iridotomy. In cases where elevated IOP becomes an issue, aqueous suppressants are helpful in reducing IOP. Prostaglandin analogues have been shown to be effective in lowering IOP, even in angles that are partially closed. Evidence is not conclusive, however, regarding their effectiveness in cases of 360° degrees of synechial closure. The role of PI and other surgical interventions are described below. See Primary prevention section for information regarding prophylactic LPI for narrow angles. In angle closure secondary to pupillary block, an iridotomy is the definitive treatment. Laser peripheral iridotomy (LPI) is considered an effective and safe treatment. It often breaks an attack of acute angle closure and can prevent future attacks. An incisional iridectomy may be necessary in cases of cloudy corneas, flat anterior chamber, poor patient cooperation at the laser, or inability to substantially lower the IOP with medications after a failed LPI attempt. The fellow eyes of patients that have undergone primary acute angle-closure are generally at significant risk for an acute attack and should receive an iridotomy. An untreated fellow eye has a 40% to 50% chance of developing an acute PAC attack over the next 5 to 10 years. Chronic miotic therapy is not an acceptable alternative, as 50% of contralateral eyes of individuals suffering acute PAC developed acute attaks when treated with pilocarpine alone. This is in contrast to the 1.8% of patients treated with prophylactic incisional iridectomy who developed an attack during this same time period. LPI relieves the pupillary block component in chronic disease and may halt the progression of synechial closure and progressive IOP elevation. Its ability to control IOP, however, may not be long-lasting, especially in eyes where glaucomatous optic neuropathy has already developed. Additional medications or surgical treatment is often necessary. In cases where LPI does successfully lower IOP, eyes still need to be monitored routinely as IOP can increase months or years after the procedure. The most common complications of LPI are transient bleeding at site of treatment, hyphema, postoperative pressure spike, and anterior chamber inflammation. Occasionally, patients may complain of a seeing a double image if the lid does not cover the iridotomy site. More severe but rare complications include aqueous misdirection and injury to the cornea, lens, or retina. In laser iridoplasty, contraction burns of long duration, low power, and large spot size are placed on the peripheral iris to contract the iris stroma and physically pull the iris from the drainage angle in an attempt to open the angle. In acute angle closure, iridoplasty has been found effective and safe in short-term lowering of IOP. It can be used in cases that are medically unresponsive, in which systemic carbonic anhydrase inhibitors must be avoided, when immediate iridotomy is not possible, or rarely when the attack continues despite a successful LPI. It is the procedure of choice for plateau iris syndrome when the angle fails to open and IOP remains elevated despite a patent peripheral iridotomy. In chronic cases of angle closure, iridoplasty may slightly decrease the formation of PAS. It is important to note that iridoplasty does not eliminate pupillary block, so iridotomy remains necessary if pupillary block is the mechanism of angle closure. Potential complications include IOP spike, iris atrophy from destruction of iris vessels, corneal burns, marked anterior chamber inflammation, and corneal endothelial damage. In PAC, since the lens is a key player in development of relative pupillary block, it makes sense that cataract extraction can lower IOP in both acute and chronic angle closure. Removal of the lens from an eye with a crowded anterior chamber opens the angle and may prevent or reduce PAS formation. In one study, early phacoemulsification was found to be better than LPI at preventing IOP rise after an acute angle closure event was controlled medically. Cataract extraction in the setting of an acute angle-closure attack, however, is technically difficult. The eye is inflamed with significant corneal edema, a shallow anterior chamber, an atrophic and atonic iris that is difficult to dilate, and possible zonular weakness. It may be more prudent to control the acute attack with medications and LPI first and then wait to perform surgery when the eye has recovered and is less inflamed. In the chronic phase when patent laser iridotomy and medical treatment have failed to adequately control IOP, lens extraction many months after the initial attack has been found to reduce IOP and reduce the need for IOP medications. Cataract extraction can be combined with goniosynechialysis to further improve IOP control in the short term. Methods of goniosynechialysis include breaking synechiae with a heavy viscoelastic (viscogonioplasty), forceps, or a cyclodialysis spatula. 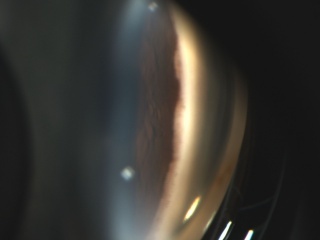 In lens-induced ACG, which includes phacomorphic glaucoma and angle closure due to forward subluxation of the lens, the definitive treatment is lensectomy. Acute attacks can be first controlled with medical therapy and/or LPI with lens extraction performed when the eye is quiet. Whether to perform filtration surgery versus a tube shunt procedure for secondary angle closure glaucoma depends on the underlying etiology. In most cases, dealing with the underlying pathology (e.g. stopping topiramate in drug-induced glaucoma, removing the lens in lens-induced glaucoma) will slow or stop the progression of disease. If medical therapy is not sufficient to control IOP, even when the primary pathology has been addressed, glaucoma surgery may be necessary and filtration surgery may be appropriate. Conditions such as neovascular glaucoma and ICE, however, tend to do better with glaucoma drainage implants. (see below). It has been proposed that combined phacotrabeculectomy may be more effective at controlling IOP than cataract extraction alone. Recent study results have been mixed, with some showing phacoemulsification as being superior for deepening the chamber, the two procedures being equal in terms of IOP control, and combined procedures being superior for IOP control. Of note, one randomized control trial found that patients who undergo combined procedures have more postoperative complications and progression of their optic neuropathy compared to the phacoemulsification alone group, so the risks and benefits of each procedure need to be carefully considered in each case until more definitive evidence is available. A limited number of studies look at the use of tube shunt devices in PACG. PACG eyes are often placed into the category of refractory glaucoma along with other types of glaucoma and thus are not separately evaluated. Based on the limited data available in these studies, tube implants appear effective in controlling IOP in PACG. Drainage implants are considered more effective than filtering procedures in neovascular glaucoma and ICE syndrome because, in these diseases, a fibrovascular membrane often grows over the sclerostomy site causing bleb failure. May be required depending on the etiology of the underlying disease. Aqueous misdirection: Nd:YAG laser can be used to disrupt the anterior vitreous in aphakic and pseudophakic eyes. If that is not successful, definitive surgical treatment in the form of vitrectromy with anterior hyaloid disruption combined with an anterior chamber deepening procedure may be indicated. Epithelial and/or fibrous downgrowth: radical surgery to remove the intraocular membrane and affected tissues may be necessary. Angle closure that develops after retina surgery may require removing or loosening encircling bands, opening up iridectomy sites, or removing silicone oil. Patients typically need to be watched closely in the immediate postoperative period, sometimes weekly for several months. Once IOP control is achieved and the eye is stabilized, follow up can follow the schedule of routine PACG patients. Complications of acute angle attacks are the result of a rapid, extreme rise in IOP. Possible sequelae include corneal decompensation, cataractous lens changes, iris ischemia resulting in atrophy and distortion, ciliary body shutdown with resultant hypotony, central retinal vein occlusion, optic nerve ischemia, and acute permanent vision loss. Complications of chronic disease include all the same ones that can be seen in acute disease. The difference in chronic disease is that these conditions develop in a more insidious fashion over a longer period of time. These patients typically have asymptomatic progression of glaucomatous optic neuropathy with corresponding visual field defects developing over time. The overall likelihood of an individual with a narrow angle developing acute angle closure in the United States is less than 10%. A prospective multicenter study, however, found that patients judged to be at risk for developing ACG by experienced ophthalmologists through careful slit lamp exam and gonioscopy had a 30% risk of developing angle closure within 5 years when no prophylactic intervention was performed. See “Primary Prevention” for recommendations regarding prophylactic LPI in PACS. In an eye suffering an acute angle-closure attack, the long-term outcomes vary depending on ethnicity (which may be a reflection of mechanism of angle closure), duration of attack, and severity of attack in terms of whether or not it can be aborted by medical treatment alone. If promptly treated, most (60%–75%) symptomatic episodes of angle closure recover without visual field or optic disc damage in the short term. Six months post-attack, one study reported 38% of eyes to have visual field loss secondary to nerve fiber bundle loss. In another study, 2 - 16 weeks after an attack, changes were noted in optic disk morphology, with preferential loss in the superotemporal and inferotemporal areas. The longer the duration of an attack and the more difficult to manage, the worse the outcome for the eye, regardless of the initial IOP measurement. Patients with a 24 to 72 hour delay in presentation had a relative risk of 2.78 for developing chronic glaucoma, whereas those requiring laser iridotomy to control IOP or a trabeculectomy had relative risks of 3.63 and 4.83, respectively. In Singapore, risk of visual field loss was significant if the duration of symptoms was longer than 7 days. Even despite successful termination of an acute attack by surgical iridectomy, late IOP increase is reported in 19% to 24% of cases. There may be ethnic differences in the rate of IOP control by LPI alone. A greater extent of PAS, a high presenting IOP, and a larger cup to disc ratio have been reported as predictors of poor pressure control following iridotomy in Asian and African eyes. A significant portion of patients go on to develop PACG and require further medical or surgical intervention in an attempt to control their disease. Unfortunately, up to 20% these patients deteriorate to lose significant vision and are classified as blind in that eye. Asymptomatic angle-closure patients present with more severe visual field defects than symptomatic patients. In one study which examined visual field loss on presentation, 52.8% of asymptomatic PACG had end stage visual field loss by Advanced Glaucoma Intervention Study criteria compared to only 17.5% of symptomatic PAC cases. Although presenting IOP was considerably higher in the symptomatic group, the level of IOP was not found to be a significant predictor for visual field outcome. It is likely that the duration of elevated IOP has a major influence in causing optic nerve damage in PACG, possibly more so than the level of IOP. Once glaucomatous optic neuropathy has developed, almost all cases will require further treatment to control IOP (94%–100%). Closer monitoring of IOP is recommended in CACG compared to POAG, despite the efficacy of medical therapy. Chronic angle-closure glaucoma tends to progress more quickly and fail medical therapy sooner than POAG. With aggressive management, however, chronic ACG patients can maintain stable fields and long-term IOP control. The prognosis for secondary angle closure patients depends on the underlying etiology. Early recognition of the underlying pathology and timely directed treatment helps to improve outcomes. Boyd K, McKinney JK. Chronic Angle-Closure Glaucoma. American Academy of Ophthalmology. EyeSmart® Eye health. https://www.aao.org/eye-health/diseases/chronic-angle-closure-glaucoma. Accessed March 07, 2019. * Boyd K, McKinney JK. Glaucoma. American Academy of Ophthalmology. EyeSmart® Eye health. https://www.aao.org/eye-health/diseases/glaucoma-list. Accessed March 13, 2019. AAO Glaucoma PPP Panel. Primary Angle Closure Preferred Practice Pattern. San Francisco: Academy of Ophthalmology; 2005. Basic and Clinical Science Course - Glaucoma (Section 10). San Francisco: American Academy of Ophthalmology; 2008. University of Iowa. Atlas of Gonioscopy. www.gonioscopy.org. Accessed 6/24/10. Shields MB. Textbook of Glaucoma. 5th ed. Baltimore: Lippincott Williams & Wilkins; 2005. Tasman W, Jaeger EA, eds. Duane's Clinical Ophthalmology. Philadelphia: Lippincott Williams & Wilkins; 2004. ↑ Foster PJ, Buhrmann R, Quigley HA, Johnson GJ. The definition and classification of glaucoma in prevalence surveys. Br J Ophthalmol. 2002;86:238–242. ↑ Van Herick W, Shaffer RN, Schwartz A. Estimation of width of angle of anterior chamber. Incidence and significance of the narrow angle. Am J Ophthalmol 1969;68:626-9. ↑ Lowe RF. Aetiology of the anatomical basis for primary angle-closure glaucoma. Biometrical comparisons between normal eyes and eyes with primary angle-closure glaucoma. Br J Ophthalmol 1970;54:161-9. ↑ Perkins ES. Family studies in glaucoma. Br J Ophthalmol 1974;58:529-35. ↑ Wang N, Wu H, Fan Z. Primary angle closure glaucoma in Chinese and Western populations. Chin Med J (Engl). 2002;115:1706–1715. ↑ 6.0 6.1 Foster PJ, Baasanhu J, Alsbirk PH, et al. Glaucoma in Mongolia. A population-based survey in Hovsgol province, northern Mongolia. Arch Ophthalmol. 1996;114:1235-41. ↑ 7.0 7.1 7.2 Seah SK, Foster PJ, Chew PT, et al. Incidence of acute primary angle-closure glaucoma in Singapore. An island-wide survey. Arch Ophthalmol. 1997;115:1436-40. ↑ Quigley HA, Broman AT. The number of people with glaucoma worldwide in 2010 and 2020. Br J Ophthalmol. 2006;90:262–267. ↑ Bourne RR, Sorensen KE, Klauber A, et al. Glaucoma in East Greenlandic Inuit--a population survey in Ittoqqortoormiit (Scoresbysund). Acta Ophthalmol Scand. 2001;79:462-7. ↑ Nguyen N, Mora JS, Gaffney MM, et al. A high prevalence of occludable angles in a Vietnamese population. Ophthalmology. 1996;103:1426-31. ↑ Lai JS, Liu DT, Tham CC, et al. Epidemiology of acute primary angle-closure glaucoma in the Hong Kong Chinese population: prospective study. Hong Kong Med J. 2001;7:118-23. ↑ Van Herick W, Shaffer RN, Schwartz A. Estimation of width of angle of anterior chamber. Incidence and significance of the narrow angle. Am J Ophthalmol. 1969;68:626-9. ↑ Alsbirk PH. Anatomical risk factors in primary angle-closure glaucoma. A ten year follow up survey based on limbal and axial anterior chamber depths in a high risk population. Int Ophthalmol. 1992;16:265-72. ↑ Lowe RF. Aetiology of the anatomical basis for primary angle-closure glaucoma. Biometrical comparisons between normal eyes and eyes with primary angle-closure glaucoma. Br J Ophthalmol. 1970;54:161–169. ↑ Leung CK, Cheung CY, Li H, et al. Dyanamic analysis of light-dark changes of the anterior chamber angle with anterior segment OCT. IOVS. 2007;48:4116-22. ↑ Nolan WP, See JL, Chew PT, et al. Detection of primary angle closure using anterior segment optical coherence tomography in Asian eyes. Ophthalmology. 2007;114:33-9. ↑ Alsbirk PH. Corneal diameter in Greenland Eskimos. Anthropometric and genetic studies with special reference to primary angle-closure glaucoma. Acta Ophthalmol (Copenh). 1975;53:635–646. ↑ Wyatt H, Ghosh J. Behaviour of an iris model and the pupil block hypothesis. Br J Ophthalmol. 1970;54:177–185. ↑ 20.0 20.1 Quigley HA. Angle-closure glaucoma – simpler answers to complex mechanisms: LXVI Edward Jackson Memorial Lecture. Am J Ophthalmol. 2009;148(5):657-669.e1. ↑ Wand M, Grant WM, Simmons RJ, Hutchinson BT. Plateau iris syndrome. Trans Sect Ophthalmol Am Acad Ophthalmol Otolaryngol. 1977;83:122–130. ↑ He M, Foster PJ, Johnson GJ, Khaw PT. Angle-closure glaucoma in East Asian and European people. Different diseases? Eye. 2006;20:3–12. ↑ He M, Huang W, Friedman DS et al. Slit lamp simulated oblique flashlight test in the detection of narrow angles in chinese eyes: The Liwan eye study. Invest Ophthalmol Vis Sci. 2007;48:5459–5463. ↑ Nolan WP, Aung T, Machin D et al. Detection of narrow angles and established angle closure in Chinese residents of Singapore: Potential screening tests. Am J Ophthalmol. 2006;141:896–901. ↑ Palmberg P. Shedding light on gonioscopy. Arch Ophthalmol. 2007;125:1417–1418. ↑ Barkana Y, Dorairaj SK, Gerber Y, et al. Agreement between gonioscopy and ultrasound biomicroscopy in detecting iridotrabecular apposition. Arch Ophthalmol. 2007;125:1331–1335. ↑ Foster PJ, Aung T, et al. Defining “occludable” angles in population surverys: drainage anger width, peripheral anterior synechiae, and glaucomatous optic neuropathy in east Asian people. Br J Ophthalmol. 2004;88(4):486-90. ↑ 28.0 28.1 Wilensky JT, Kaufman PL, Frohlichstein D et al. Follow-up of angle-closure glaucoma suspects. Am J Ophthalmol. 1993;115:338–346. ↑ Friedman DS, Gazzard G, Foster P et al. Ultrasonographic biomicroscopy, Scheimpflug photography, and novel provocative tests in contralateral eyes of Chinese patients initially seen with acute angle closure. Arch Ophthalmol. 2003;121:633–642. ↑ Wang B, Congdon NG, et al. Dark room provocative test and extent of angle closure: an anterior segment OCT study. J Glaucoma. 2009 Jul 9 (Epub ahead of print). ↑ 31.0 31.1 Garcia JP Jr, Rosen RB. Anterior segment imaging: optical coherence tomography versus ultrasound biomicroscopy. Ophthalmic Surg Lasers Imaging. 2008;39(6):476-84. ↑ 32.0 32.1 Aung T, Wong HT, Yip CC et al. Comparison of the intraocular pressure-lowering effect of latanoprost and timolol in patients with chronic angle closure glaucoma: A preliminary study. Ophthalmology. 2000;107:1178–1183. ↑ Hung PT, Hsieh JW, Chen YF, Wei T. Efficacy of latanoprost as an adjunct to medical therapy for residual angle-closure glaucoma after iridectomy. J Ocul Pharmacol Ther. 2000;16:43–47. ↑ 34.0 34.1 34.2 Aung T, Chew PT. Review of recent advancements in the understanding of primary angle-closure glaucoma. Curr Opin Ophthalmol. 2002;13:89–93. ↑ 35.0 35.1 35.2 35.3 Edwards RS. Behaviour of the fellow eye in acute angle-closure glaucoma. Br J Ophthalmol. 1982;66:576–579. ↑ 36.0 36.1 Snow J. Value of prophylactic peripheral iridectomy on the second eye. Trans Ophthalmol Soc UK. 1977;97:189–191. ↑ 37.0 37.1 Lowe RF. Acute angle-closure glaucoma. The second eye: an analysis of 200 cases. Br J Ophthalmol. 1962;46:641-50. ↑ 38.0 38.1 38.2 Ang LP, Aung T, Chew PT. Acute primary angle closure in an Asian population: long-term outcome of the fellow eye after prophylactic laser peripheral iridotomy. Ophthalmology. 2000;107:2092-6. ↑ Lowe RF. Primary angle-closure glaucoma. Prevention and early treatment. Isr J Med Sci. 1972;8:1362–1365. ↑ Saw SM, Gazzard G, Friedman DS. Interventions for angle-closure glaucoma: an evidence-based update. Ophthalmology. 2003;11:1869-78. ↑ Alsagoff Z, Aung T, Ang LP, Chew PT. Long-term clinical course of primary angle-closure glaucoma in an Asian population. Ophthalmology. 2000;107:2300–2304. ↑ Ritch R, Solomon LD. Argon laser peripheral iridoplasty for angle-closure glaucoma in siblings with Weill-Marchesani syndrome. J Glaucoma. 1992;1:243–247. ↑ Lim AS, Tan A, Chew P et al. Laser iridoplasty in the treatment of severe acute angle closure glaucoma. Int Ophthalmol. 1993;17:33–36. ↑ Ritch R, Tham CC, Lam DS. Argon laser peripheral iridoplasty (ALPI): An update. Surv Ophthalmol. 2007;52:279–288. ↑ Chew PT, Yeo LM. Argon laser iridoplasty in chronic angle closure glaucoma. Int Ophthalmol. 1995;19:67–70. ↑ Lai JS, Tham CC, Chua JK, Lam DS. Immediate diode laser peripheral iridoplasty as treatment of acute attack of primary angle closure glaucoma: a preliminary study. J Glaucoma. 2001;10:89–94. ↑ Lam DS, Leung DY, et al. Randomized trial of early phacoemulsification versus peripheral iridotomy to prevent intraocular pressure rise after acute primary angle closure. Ophthalmology. 2008;115(7):1134-40. ↑ Imaizumi M, Takaki Y, Yamashita H. Phacoemulsification and intraocular lens implantation for acute angle closure not treated or previously treated by laser iridotomy. J Cataract Refract Surg. 2006;32:85–90. ↑ Yoon JY, Hong YJ, Kim CY. Cataract surgery in patients with acute primary angle-closure glaucoma. Korean J Ophthalmol. 2003;17:122–126. ↑ Acton J, Salmon JF, Scholtz R. Extracapsular cataract extraction with posterior chamber lens implantation in primary angle-closure glaucoma. J Cataract Refract Surg. 1997;23:930–934. ↑ Teekhasaenee C, Ritch R. Combined phacoemulsification and goniosynechialysis for uncontrolled chronic angle-closure glaucoma after acute angle-closure glaucoma. Ophthalmology. 1999;106:669–674. ↑ Salmon JF. The role of trabeculectomy in the treatment of advanced chronic angle closure glaucoma. J Glaucoma. 1993;2:285–190. ↑ Lai JS, Tham CC, Lam DS. Incisional surgery for angle closure glaucoma. Semin Ophthalmol. 2002;17:92–99. ↑ Trope GE, Pavlin CJ, Bau A et al. Malignant glaucoma. Clinical and ultrasound biomicroscopic features. Ophthalmology. 1994;101:1030–1035. ↑ Mills DW, Willis NR. Malignant glaucoma - the long and short of it. Can J Ophthalmol. 1978;13:86–88. ↑ Jain I, Gupta A, Dogra M. Surgery in angle closure glaucoma: Late complications. Glaucoma. 1984;6:54–57. ↑ Tham CC, Leung DY, et al. Effects of phacoemulsification versus combined phaco-trabeculectomy on drainage angle status in primary angle closure glaucoma (PACG). J Glaucoma. 2010;19(2):119-23. ↑ Tsai HY, Liu CJ, Cheng CY. Combined trabeculectomy and cataract extraction versus trabeculectomy alone in pimary angle-closure glaucoma. Br J Ophthalmol. 2009;93(7):943-8. ↑ Tham CC, Kwong YY, et al. Phacoemulsification versus combined phacotrabeculectomy in medically uncontrolled chronic angle closure glaucoma with cataracts. Ophthalmology. 2009;116(4):725-31, 731.e1-3. ↑ Tham CC, Kwong YY, et al. Phacoemulsification vs phacotrabeculectomy in chronic angle-closure glaucoma with cataract complications. Arch Ophthalmol. 2010;128(3):303-11. ↑ Deokule SP, Molteno AC, Bevin TH, Herbison P. Long-term results of Molteno implant insertion in cases of chronic angle closure glaucoma. Clin Experiment Ophthalmol. 2007;35:514–519. ↑ Spaeth GL. Gonioscopy: Uses old and new. The inheritance of occludable angles. Ophthalmology. 1978;85:222–232. ↑ Friedman DS, Chew PT, Gazzard G et al. Long-term outcomes in fellow eyes after acute primary angle closure in the contralateral eye. Ophthalmology. 2006;113:1087–1091. ↑ 65.0 65.1 Douglas GR, Drance SM, Schulzer M. The visual field and nerve head in angle-closure glaucoma. A comparison of the effects of acute and chronic angle closure. Arch Ophthalmol. 1975;93:409–411. ↑ 66.0 66.1 66.2 Aung T, Looi AL, Chew PT. The visual field following acute primary angle closure. Acta Ophthalmol Scand. 2001;79:298–300. ↑ Shen SY, Baskaran M, Fong AC et al. Changes in the optic disc after acute primary angle closure. Ophthalmology. 2006;113:924–929. ↑ David R, Tessler Z, Yassur Y. Long-term outcome of primary acute angle-closure glaucoma. Br J Ophthalmol. 1985;69:261–262. ↑ Playfair TJ, Watson PG. Management of acute primary angle-closure glaucoma: A long-term follow-up of the results of peripheral iridectomy used as an initial procedure. Br J Ophthalmol. 1979;63:17–22. ↑ 70.0 70.1 Wong JS, Chew PT, Alsagoff Z, Poh K. Clinical course and outcome of primary acute angle-closure glaucoma in Singapore. Singapore Med J. 1997;38:16–18. ↑ Krupin T, Mitchell KB, Johnson MF, Becker B. The long-term effects of iridectomy for primary acute angle-closure glaucoma. Am J Ophthalmol. 1978;86:506–509. ↑ Saraux H, Offret H. Long-term study of patients with iridectomy for angle-closure glaucoma. Glaucoma. 1979;1:149–151. ↑ Nolan WP, Foster PJ, Devereux JG et al. YAG laser iridotomy treatment for primary angle closure in East Asian eyes. Br J Ophthalmol. 2000;84:1255–1259. ↑ Salmon JF. Long-term intraocular pressure control after Nd-YAG iridotomy in chronic angle closure glaucoma. J Glaucoma. 1993;2:291–296. ↑ Aung T, Friedman DS, Chew PT et al. Long-term outcomes in Asians after acute primary angle closure. Ophthalmology. 2004;111:1464–1469. ↑ Dhillon B, Chew PT, Lim AS. Field loss in primary angle closure glaucoma. Asia Pac J Ophthalmol. 1990;2:85–87. ↑ Ang LP, Aung T, Chua WH et al. Visual field loss from primary angle-closure glaucoma: A comparative study of symptomatic and asymptomatic disease. Ophthalmology. 2004;111:1636–1540. ↑ Rosman M, Aung T, Ang LP et al. Chronic angle-closure with glaucomatous damage: Long-term clinical course in a North American population and comparison with an Asian population. Ophthalmology. 2002;109:2227–2231. ↑ See JL, Chew PT. Glaucoma in Singapore. J Glaucoma. 2004;3:417–420. ↑ Lee YH, Kim CS, Hong SP. Rate of visual field progression in primary open-angle glaucoma and primary angle-closure glaucoma. Korean J Ophthalmol. 2004;18:106–115. This page was last modified on March 13, 2019, at 14:46. This page has been accessed 235,179 times.